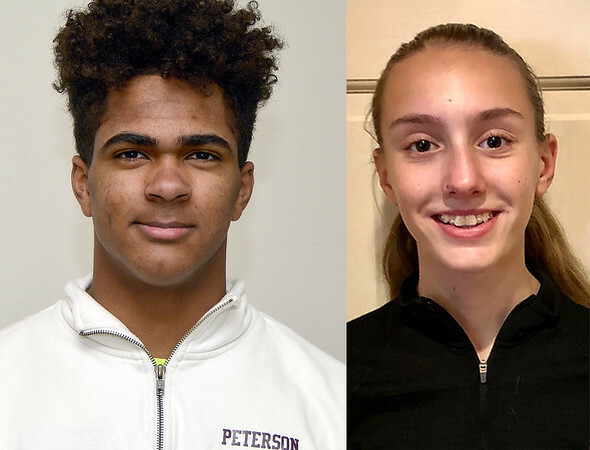 A pair of indoor track athletes have earned Athlete of the Week honors this week, and both are repeat honorees: Kaitlin Deforest of Terryville High and Hunter Peterson of Bristol Central. Deforest, a freshman, was selected this past fall in cross country and Peterson, a senior, received the recognition last year at this time in track. Deforest, the daughter of Jennifer and former Amity High runner John Deforest of Plymouth, finished ninth in the girls 1,600 meters at the Class S meet on Thursday at the Floyd Little Athletic Center in New Haven. Her time of 5:40 was the best among Berkshire League entrants in the event and Deforest was pleased with her first state-level track competition. Her first-year coach, Kevin Schumann, was also happy. “Katie has had a great year of running thus far,” Schumann said. “Her successes in cross country gave her a good base of training for the indoor season. This is actually her first time doing track, so I was very pleased with her performance in different events this season. Deforest is also looking forward to competing outdoors this spring. Not bad for someone who started distance running just over three years ago. When asked what her goals were regarding track times before graduating in 2022, Deforest already had a handle on it. She hopes to get down to 19:30 in cross country, 5:10 in the indoor 1,600 and 5:05 outdoors. Peterson, the son of Mark and Monique Peterson, had two solid performances recently. The first was at the CCC Indoor Track and Field Championships in New Haven, where his best finish was second place in the high jump with a leap of 6-0. He also placed seventh in the triple jump at 20.1.25 and ninth as a member of the boys 4x200 relay relay with Ramon Albert, Wilmer Rivera-Ortiz and Jose Nevado with a 1:38.56 clocking. Peterson was satisfied with his high jump performance, although wanting more. His most recent and last competition of the winter season took place at the Class L meet in New Haven this past Friday. He finished eighth in the high jump with a leap of 5-8, ran in the 4x200 relay for a time of 138.47 with his same teammates from the CCC meet, and placed a respectable third with a 20-5 distance in the long jump in earning Class L All-State honors. Having claimed third in the high jump, Peterson qualified for the State Open, but a previously scheduled school trip will keep him from competing there. He’s a little disappointed, but has the spring track season remaining. “I wish I could have gone out on a better note,” Peterson said. He did add that he wants to break a school record before he graduates and that could be in any of the events he will compete in this spring, including relays. Besides track and field, Peterson played soccer for the Rams as a center back. The team put together an overall season of 8-7-4 before going on to reach the quarterfinals of the Class L tournament. His plans for next year include studying mechanical engineering in college; and as far as sports go, it’ll be track and field if possible. Contact Bob Montgomery at or by calling 860-973-1808. Posted in The Bristol Press, Athletes of the Week, Bristol Eastern, Terryville on Monday, 11 February 2019 21:29. Updated: Tuesday, 12 February 2019 11:13.